The last time we heard from Meta, the makers of the Meta 2 augmented reality headset, things looked pretty bleak. Now, as several new facts have come to light, we have confirmation regarding the beleaguered company's fate: Meta is done. As we reported back in September, the company was forced to furlough the majority of its staff after failing to secure a new $20 million funding round from investors. On Wednesday, a filing with a Delaware court inadvertently revealed that Meta is insolvent, and is, for all intents and purposes, finished. The previously reported furloughs were a major blow to the company, but rather than resulting in just the departure of middle-level staff and support team members, Next Reality has learned that one of those departures came at the executive level. We've confirmed that Joe Mikhail, the company's chief revenue officer, is no longer with Meta. It's unclear if the separation was directly related to the furloughs, or through a separate action. Mikhail represented the company at last year's AWE conference in California, the event that brings together the insiders of the AR business world. While there, he gave a stirring and passionate presentation on the company's hardware, software, and its overall future. Mikhail was so impressive in his overall efforts that he made the NR30 list of AR leaders in 2018. Before his rise to chief revenue officer, Mikhail, a veteran of Silicon Valley with a past stint at Lenovo, was a member of the company's board of directors. Before Mikhail, Meta's primary face man was Ryan Pamplin, an equally energetic and aggressive advocate of Meta's mission to take AR mainstream. In May of 2018, when Next Reality inquired about Pamplin's status following the promotion of Mikhail, the company stated that Pamplin was on a "leave of absence." 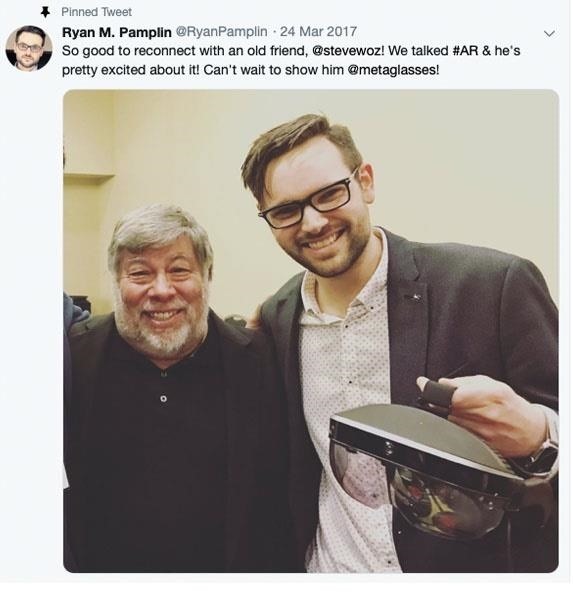 His status was never officially updated with the public, and now Pamplin — whose Twitter profile still shows him in a pinned tweet posing with a Meta 2 headset, alongside Apple co-founder Steve Wozniak — can be found promoting his new startup, BlendJet, a portable blender. The quiet disappearance of Meta leadership before the furlough event was par for the course at the company, as some other high-level team members have similarly exited the company in the last 12 months with little comment or public explanation. In fact, on the current version of the company's website, which once displayed a range of Meta team members, only the face of the company's founder and CEO, Meron Gribetz, is shown. In addition to the erasure of executives from the company's website, another major component has disappeared as well: the Meta 2 headset itself. Previously, the website displayed an option to purchase the device. Today, that option no longer appears on the site's menu. Similarly, the link to the "buy.metavision.com" section of the site no longer works. This time last year, Dell announced that it would begin selling the Meta 2 as the first major reseller of the device. But we were unable to find the Meta 2 anywhere on Dell's website, and when you search for "augmented reality" on the site, the only AR product displayed is DAQRI's Smart Glasses. Dell did not immediately provide an answer to this absence when contacted by Next Reality. 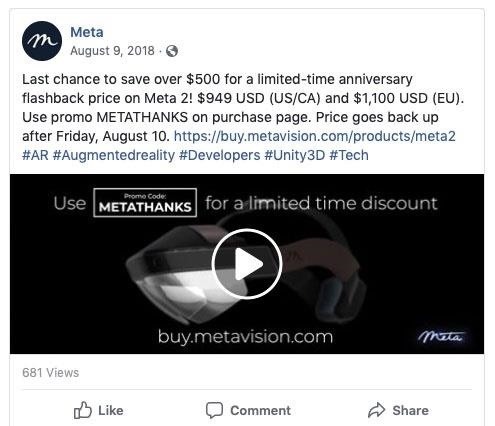 The disappearance of the device looks even worse because Meta began offering steep discounts on the Meta 2 last August, selling it for $949, a markdown of over $500 from its normal $1,495 price. Any company facing Meta's funding woes, executives departures, and disappearing product status would have a major problem on its hands. But one more wrinkle in the Meta story was finally resolved today. As Next Reality reported in August, Genedics, LLC slapped Meta with a patent infringement lawsuit, which alleged that Meta had infringed on patents covering "user interface methods for image manipulation and user input in a three-dimensional space where projectors display images and sensors identify user input." Initially, Meta tried to get the case moved to California, but the judge denied the motion. Then in November, Meta's legal position was significantly weakened when it asked that the court allow it to dismiss its large legal team. Judge Christopher J. Burke, U.S. Magistrate Judge of the United States District Court for the District of Delaware, granted the request and ordered Meta to find new counsel. That was was months ago, and since then, little progress had been made, until today. 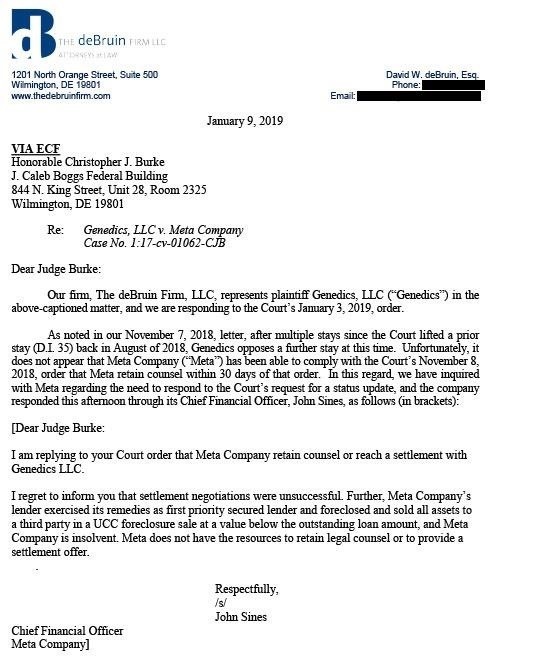 In a new filing with the court, lawyers for Genedics requested a status update from the court, while providing a letter from Meta that brings an end to the story. "We have inquired with Meta regarding the need to respond to the Court's request for a status update," wrote Genedics attorney David W. deBruin, "and the company responded this afternoon through its chief financial officer, John Sines, as follows…"
I am replying to your Court order that Meta Company retain counsel or reach a settlement with Genedics LLC. I regret to inform you that settlement negotiations were unsuccessful. Further, Meta Company's lender exercised its remedies as first priority secured lender and foreclosed and sold all assets to a third party in a UCC foreclosure sale at a value below the outstanding loan amount, and Meta Company is insolvent. Meta does not have the resources to retain legal counsel or to provide a settlement offer. And with that, the story of Meta is officially done. Even if they could have settled with Genedics, it's too late, as Meta's assets are being sold off and the company has run out of cash. Many of the details behind its fall are still murky, but it appears that, without additional funding, Meta didn't have the firepower to continue to fight off Genedics' patent lawsuit. But it's still not over. Genedics wants to take a look at Meta's assets. 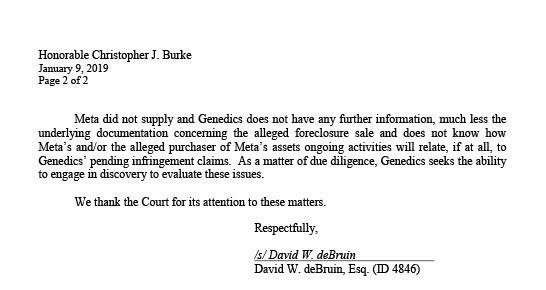 "Meta did not supply and Genedics does not have any further information, much less the underlying documentation concerning the alleged foreclosure sale and does not know how Meta's and/or the alleged purchaser of Meta's assets ongoing activities will relate, if at all, to Genedics' pending infringement claims," wrote Genedics' deBruin. "As a matter of due diligence, Genedics seeks the ability to engage in discovery to evaluate these issues." We still don't know what will happen to unsold Meta 2 inventory, its remaining staff, or its intellectual property. But the lesson that may arise from Meta's story is that it might have simply been too early to the market. Founded in late 2012, Meta got funding of around $73 million over the years. But one look at some of the polished, cheaper, more powerful AR devices being launched at CES 2019 indicates that Meta's big idea was primed for the future, but they got to market just a few years too soon to sustain their vision.